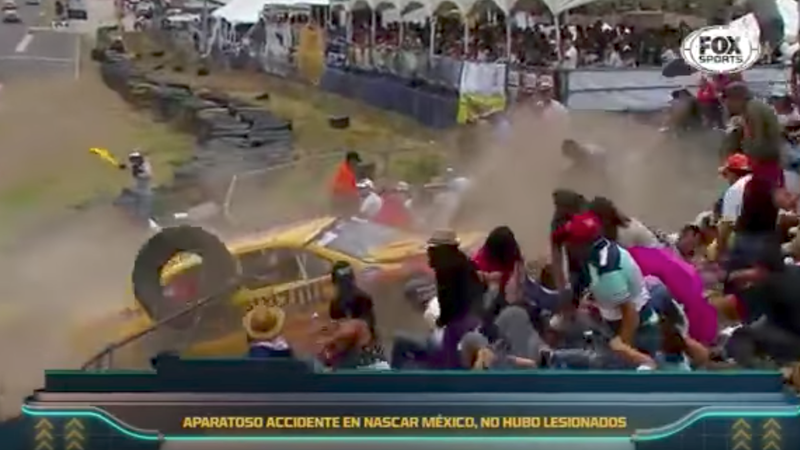 When NASCAR Peak Mexico Series driver Santiago Tovar lost his brakes in a race last week, he told Motorsport.com he “became a passenger in the car” that drove him straight into a crowd. Spectators were reportedly treated for minor injuries, but wreck footage makes things look like they could have been much worse. The race was at Autódromo de León last Sunday, a race track that Tovar later told Motorsport.com he felt was not ready to host the NASCAR event because of its length. The track is a .75-mile road course, which is just over .2 miles longer than American NASCAR’s shortest track, the Martinsville Speedway oval. In comparison, U.S. NASCAR road course Sonoma Raceway is over 2.5 miles long. The León track is a small course to road race on, and Tovar told Motorsport.com the track length isn’t enough to cool down the brakes in between turns. “The truth is that we should not bring this track, it is dangerous for everyone - drivers and public,” he said. “The cars do not fit in this track, the brakes gets very hot and from the lap five you do not know if you’re going to brake or not. The discomfort over the state of the track was also shared by Rogelio Lopez, the winner of the category. Tovar later tweeted about his displeasure with the track and the series’ visit to it, which, roughly translated by Twitter, said he isn’t pleased with its safety standards. Jalopnik has reached out to the NASCAR Mexico Series for comment on the wreck, which we could not find a statement about on the series’ website, and will update if we hear back. - There were no injuries for any person. The affected had to go for observation in the hospital because its part of the track security protocol. - In all the race tracks the security is revised by NASCAR, and they decided if there are conditions for the race. - The security on track work well. The photo that all must seen with the people beside the car, it wan`t [sic] there at the time of the accident. They went to se [sic] the car after the accident, and that`s why the car seems to be in the middle of a crowd. But the car didn`t crash to all the people you see on that photo, not at all. - The Officials will analice [sic] all the facts, and they will decide if León will continue on the Championship for the next season. - The main thing for NASCAR MÉXICO, is that nobody, audience or driver, result with injuries, and now we are looking for the next race at Aguascalientes. Some of the statements don’t line up with the video or the original reports, but that’s for you to decide.